These products were supplied for review & there are affiliate links, but all opinions are my own. If there's one thing I've hoarded ever since I was a kid, it's body wash, bubble bath and soap. I was NOT a kid you had to bribe to take a shower or a bath. I ABSOLUTELY LOVED having different kinds of soaps and suds and the fact that I don't have a bathtub in my condo would've baffled childhood-me. Every Christmas I distinctly remember begging my mom to get me the Holiday packs from The Body Shop, on vacations and trips I was always buying random bars of soaps from beauty boutiques and tourism shops (I still do this!) and in my bathroom at any given time, there is never less than three active body washes. Usually more like four or five. So it was only a matter of time before Le Petit Marseillais made it into my hands. I've seen products pop up before from other bloggers overseas, and was happy to discover that the brand finally made the journey across the pond to Canada. Now, before I go any further, I want to emphasize that that even WITHOUT my review, Le Petit Marseillais is an extremely affordable brand to the point where you should just go buy it already, but here's the top reasons why I, a body wash junkie, was really drawn to it. Despite my addiction to sandalwood and other strong, earthy scents, I also have a soft spot for more delicate fragrances too. Many of Le Petit Marseillais products are inspired by ingredients from southern France, such as the body wash scents of Orange Blossom, White Peach & Nectarine (I received these two), Lavender Honey, Cotton Milk & Poppy and last but not least, Vanilla Milk. These classic fragrances remind me of my grandmother's bathroom which I was obsessed with as a kid, as it was and still is, adorned with her favourite European bath products. I feel very few drug store brands here in North America work with these types of fragrances, or at least, they don't do it well. 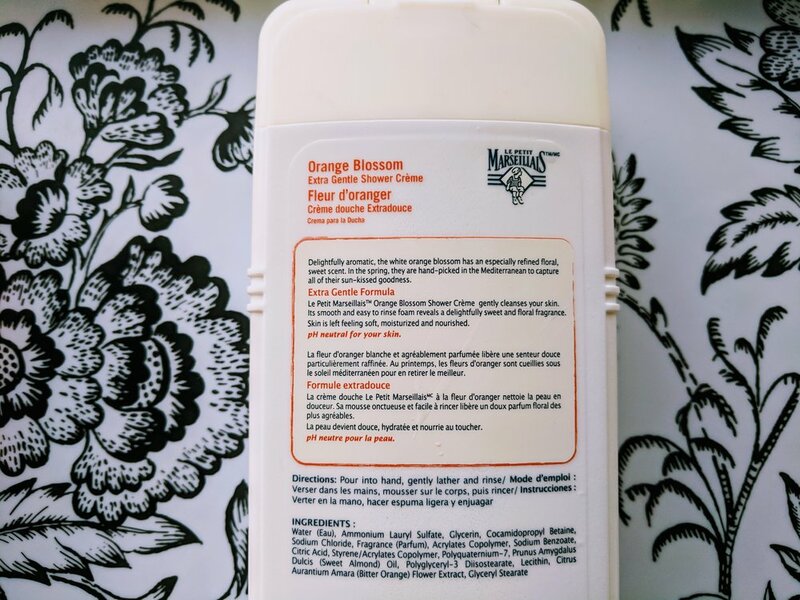 Orange Blossom is a beautiful scent that is very relaxing and soothing at the end of the day, while White Peach & Nectarine is literally a joy to suds up, with a very aromatic but sweet juicy scent, perfect for morning showers. I like to wear my own fragrances and these scents are nice but don't linger too long after you wash. I'm generally a big fan of cream washes over gel washes, because I used to suffer from ezcema as a teen and although it's GREATLY lessened since then, I have to keep myself and my skin hydrated and gel washes tend to dry me out a bit more than I'd like. Le Petit Marseillais also offers PH balanced products that help your skin from being stripped dry in the shower, leaving you slightly more plump and moisturized than some of the drug store competitors. Now, long-time readers of this blog know I'm a regular at Lush and L'Occitane and their (very different) product lines that embrace fragrance and unique ingredients. But while I do enjoy my Lush body washes, and my L'Occitane Almon and Verbena products in particular, Le Petit Marseillais cannot be beat for price. It's so affordable that you could get all 5 of the body washes for $25. It's literally unbeatable, and you get some quality for that price which former frugal-Danielle really appreciates. I'm looking forward to more of the brand making it over to the shelves here, I see that the US launch has body balms and hand lotions and if they can compete with my pricier alternatives, I'll end up saving a lot of money! You can find Le Petit Marseillais at Walmart, Rexall and Shoppers Drug Mart, prices vary from $4.99-&7.99.